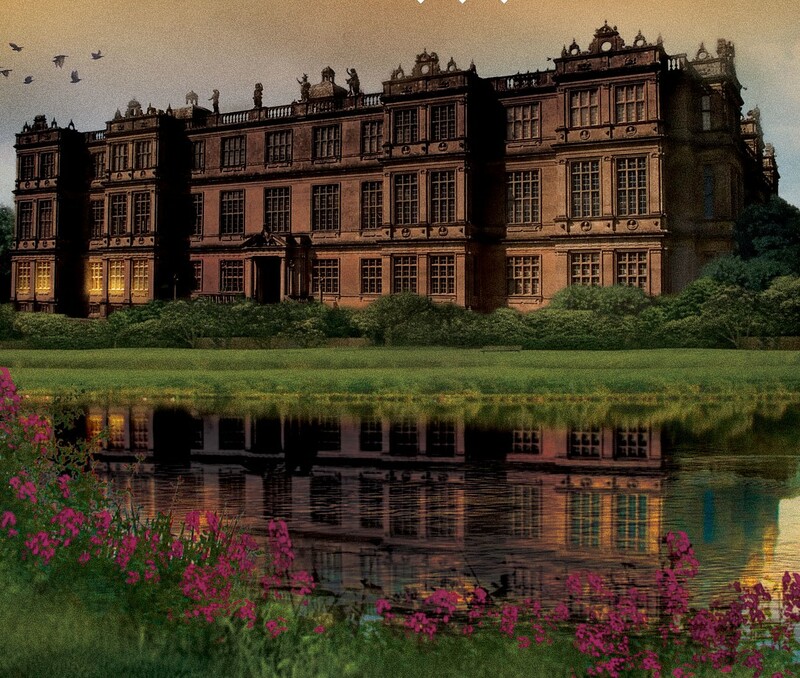 To celebrate the cover reveal for DEATH OF A DISHONORABLE GENTLEMAN I thought it would be fun to concoct a history of the house featured in the novel. Clearly from the cover Iyntwood House is a very grand building indeed; the sort of house that if it survived the deprivations of the last century would probably be owned by the National Trust today. So without more ado here is a little bit of background, such fun! Geoffrey Talbot, a clerk at the Tudor Court of Henry VIII, was knighted for services to the crown and rewarded with the land on which Maskwell Abby had stood before the Dissolution of the Monasteries in 1541, when it was razed to the ground. It is thought that Talbot was part of Thomas Cromwell’s dissolution program which would account for his rapid rise in the court and for his being able to fund the building of what is today Iyntwood House which was completed in 1580. During the Civil War, when many similar houses were levelled because of their owners’ Royalist support the Talbot family kept their heads, their lands and their house by providing a full Regiment of Horse for Cromwell’s New Model Army (1645) and so their magnificent home was spared. Throughout the uncertain years following the Civil War the Talbots remained carefully moderate. But it was Talbot money that conspicuously supported Charles Stewart’s return to England (when his succession was assured and not before in 1661) to be crowned Charles II. The sum of money involved must have been considerable because despite Sir Gervase Talbot’s anti-royalist politics of the preceding years he was awarded a prominent position in Charles II’s court together with an elevation to the peerage as Earl of Montfort. Some of the best examples of Elizabethan architecture can be found at Iyntwood House: the large stone mullioned windows, with leaded light casements form a particularly handsome aspect to its façade below an ornate balustrade roofline. Within, the Great Hall which in earlier days would have been the center of activity is used today as a formal banqueting hall and has a thirty-five foot high ceiling, supported by ten huge hammer beams. 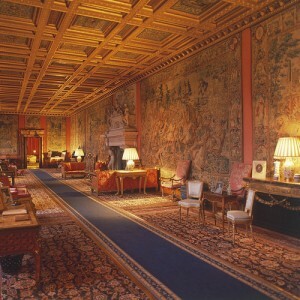 The original Jacobean tapestries and paintings still hang on its walls. Around 1600, a minstrels’ gallery was added to the ballroom, and in 1663 the small gallery was created to honor a visit by Charles II and Queen Catherine, who stayed overnight with their entire retinue and who had such a thoroughly good time they made many return visits. By the early 19th century the 4th Earl considerably enriched by profits from the sugar trade, decided to ‘modernize’ Iyntwood House, and create more privacy within the original Elizabethan structure.. He employed the fashionable architect Sir Jeffry Wyatt, who introduced a sequence of splendid corridors so that reception rooms could be accessed without walking through one to the other. A new stable block and an orchid house and kitchen gardens were also built at this time. The Library is said to be haunted by an elderly gentleman dressed in a gold and buff padded dressing gown who habitually smokes Indian cheroots, a distinctly strong odor which pervades the library for days after a sighting. Other ghostly beings include the infamous Lady Sarah Talbot who unhappily treads the upstairs corridor known as ‘The Silver Lady’s Walk’. Crossed in love and locked up in her room by her husband for her many infidelities Lady Sarah’s ghost is still on the look-out for an admirer: Beware! Royalty is no stranger to Iyntwood, Queen Elizabeth I was the first royal guest in 1574, although she did not apparently approve of the Countess, Lady Meredith Talbot and it was for this reason that the countess was encouraged to visit her family when Good Queen Bess came to Iyntwood. The Restoration years were riotous and bountiful ones for Iyntwood. 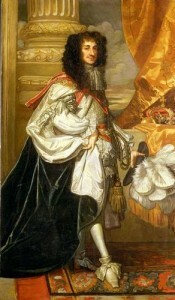 The Merry Monarch, Charles II, enjoyed the generous hospitality of Lord Talbot and made Iyntwood his haunt of pleasure during his reign. 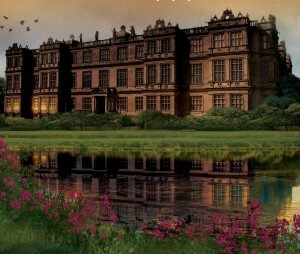 Charles and his court were lavishly entertained; plays and musical events were performed in the old Saxon moated castle on the estate, now a romantic ruin, and lavish picnics arranged in fleets of gondolas on the lake by the house. Almost financially ruined by the end of Charles II reign the Talbot family made a meteor-like rise to former financial splendor in the mid-18th century thanks to the burgeoning sugar trade in the West Indies. Until his death in 1910 King Edward VII was a frequent visitor throughout his adult life as both Prince of Wales and monarch during the shooting season. On one occasion the king was fortunate to bag 1500 pheasant during a 3 day visit.